Reading funeral poems is one of the beautiful ways for someone grieving to express love, grief, and sadness, among other feelings that come with losing a loved one. Listening to a carefully chosen funeral poem can give comfort to people left behind. For some, it is used to give tribute and pay respect to someone they just lost. For others, it is a way to make the funeral service a more personalized one. A funeral poem is called elegy in the English literature. It came from the Greek word ‘elegeia’ that means ‘lament.’ It is also called poem of mourning and common themes include a reflection of what death is, a reflection of sorrow, and reflection of support. Some also write a poem that expresses the hope of the afterlife. A hope that the deceased is now in a better world. They say there are two reasons why people recite funeral poems during a wake. It is to express sorrow for the death of a loved one and to express gratitude to the said person. In return, while reciting a funeral poem, it can also give comfort to the bereaving family. A poem of mourning is read during wakes and during services. it is recited by a family member or a close friend of the deceased. There is no limit as to how many funeral poems can be read but in a methodologically arranged funeral, one or two funeral poems is considered enough. Reading a funeral poem can enhance a funeral ceremony. A perfectly chosen poem can make the funeral service more meaningful for everyone, especially those who were left behind. Not all grieving families can be brave enough to read a funeral poem knowing that they might break down in the middle. Some just add a funeral poem on the printed funeral program given to visitors. A funeral poem can be used to express grief to the grieving family as well and can be sent as a condolence or sympathy message. However, not all funeral poems can have its warranted effect. There are different types of funeral poems and choosing the right one is very important. Choosing a funeral poem depends on different factors. You can either choose from popular funeral poems that you can find online or you can write your own verse. If you are going to choose from a list of famous funeral poems, you must know if you are looking for a funeral poem for a mother, a father, wife, husband, sister, brother, grandparent or you just want to read a comforting poem. TRADITIONAL FUNERAL POEMS – these are popularly written funeral poems read in most funerals. Examples are ‘Sonnet’ 60 by William Shakespeare, ‘Do not go gentle into that good night’ by Dylan Thomas, and ‘Do not stand at my grave and weep’ by Mary Elizabeth Frye. RELIGIOUS FUNERAL POEMS – religious funeral poems are verses taken from the Bible, from the book of Psalm. Psalm 23 is the most popular one because it talks about God’s love and comfort to those who are mourning the loss of their loved one. POEMS BY CONTEMPORARY AUTHORS – contemporary authors refer to funeral poems that are popular are on the internet today. These are funeral poems shared over the internet and became popular because of their moving lines and powerful messages. CUSTOM WRITTEN – custom funeral poems are poems written by someone who knew the deceased so well. It can be about the favorite movie of the deceased one, a favorite song, a hobby, an attitude or his known character. Should it be a religious or non-religious funeral poem? Can it trigger memories of the deceased? Can it reflect a philosophy or personality of the deceased? Does it contain an appropriate message or information? Does it express your emotions? Does it bring comfort to those who will hear it? Reading a funeral poem is a positive way of expressing sadness for most people who lose their loved ones. They said nothing can lessen the grief that death brings that even famous poets of our times have failed to capture it in their words. Still, reading a funeral poem can help grieving families to release their emotions during their dark time. In choosing a funeral poem, should you go for a traditional or popular funeral poem or should you just write your own poem? Choosing a traditional or popular funeral poem is easier for people who are too emotional. When in grief, it might be too difficult to get a pen and paper and pour your emotions through words. if you are an emotional person, it might be easier to choose from popular funeral poems that you can read or add on a printed funeral program. However, if you want to make every detail of the funeral personal because the deceased is the most important person in your life, then you might as well write a funeral poem to read. If you will write your own poem, you can focus on things that are important to the deceased such as his or her accomplishments, his or her positive character, and his or her joyful personality. 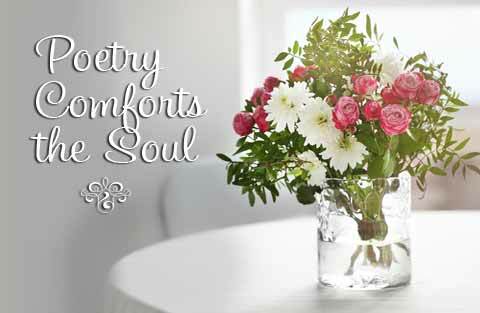 We've compiled the best selection of funeral poetry with heartfelt words to touch and comfort a grieving heart. We've categorized our collection for easier navigation. Click on any of our links below to read specific poems within each section.